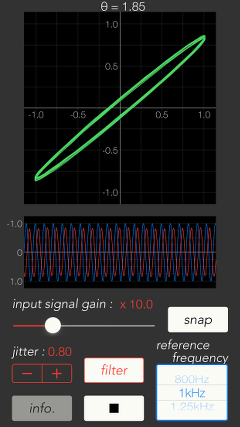 toon|Sound Lissajous Meter Support - toon,llc. Lissajous is a planar figure obtained by combining two single vibrations vibrating in directions perpendicular to each other. 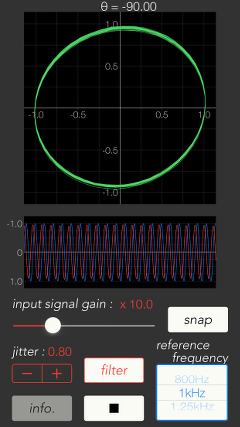 This app can be displayed in a two-dimensional curve by Lissajous in the vertical axis as a microphone input signal and the horizontal axis as a reference sine wave. 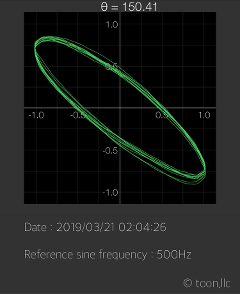 For example, when a sine wave with the same frequency as the reference sine wave is reproduced from an audio system, you can observe changes of the frequency or phase in a Lissajous curve pattern. In the case of an unknown sound source, you can analyze the source using the correlation between amplitude, frequency and phase and the reference sine wave. In addition, It can display Lissajous demo according to changes in frequency and phase. Please use for Lissajous pattern understanding and learning. Please to click the following link to download "Sound Lissajous Meter" from App StoreTM. It will be open the download page on App StoreTM. Recommendation : Requires iOS 12.1.4 or later. Checking phase of room acoustics or monitoring changes in amplitude, phase and frequency from place to place. Analysis of unknown sound signal. Monitoring and analysis of environmental sounds. "Sound Lissajous Meter" displays audio signals in Lissajous curves in real-time. (1) Adjustment of input signal gain : By adjusting the gain of the input signal, you can resize the Lissajous curve of the measurement display to an appropriate size. (2) Selection of reference frequency: Select the frequency of reference signal (sine wave). (3) Filter: Turn on the noise filter if the input signal contains a lot of noise and the measurement display is unstable. The default is filter off. (4) Jitter correction: Jitter correction is performed when the phase of the measurement display is unstable, such as rotation. The frequency of the reference signal can be adjusted in the range of ± 2 Hz. (5) Snapshot: Save the measured image to “Photos” library. It can be displayed in a two-dimensional curve by Lissajous in the vertical axis as a microphone input signal and the horizontal axis as a reference sine wave. you can analyze the source using the correlation between amplitude, frequency and phase and the reference sine wave. In addition, the waveform display of the input and reference signals and the phase θ between both signals are also displayed simultaneously. The phase θ is valid only when the reference frequency and the measurement frequency are the same. Adjust the Lissajous curve of the measurement display to the appropriate size by adjusting the gain of the input signal. Enabling the noise filter may reduce the level of the input signal extremely. 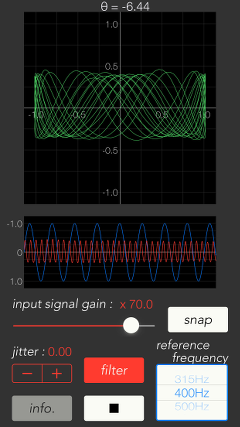 Adjust the input level to make it easy to see the amplitude of Lissajous. It generates a sine wave as a reference signal. You can select one frequency from the frequency range of 100Hz to 5kHz (18 points). If the input signal contains a lot of noise and the measurement display is unstable, you may enable the noise filter. The default is filter OFF. The filter takes out the exact maximum frequency of the frequency components contained in the input signal. It can slightly adjust the jitter between the reference frequency and the input signal. The range is ± 2 Hz per 0.01 Hz unit. The default is 0 Hz. The jitter adjustment can reduce the rotation of the phase angle when Lissajous curve's phase changes sequentially at the same observation position. But, the correction may not be possible if the phase change is severe. If you tap "Snap" button, you can capture the measured image to Photos. At the first time, the confirmation of access to Photos is required once from iOS system when you press "Snap" button. Tap "info" button to switch to the information screen. 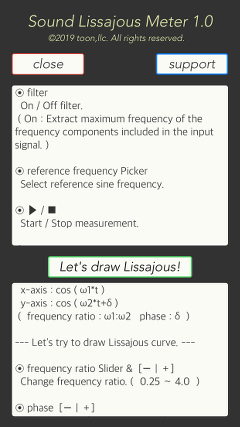 If you tap the "Let's draw Lissajous !" button, it move to Lissajous demo. 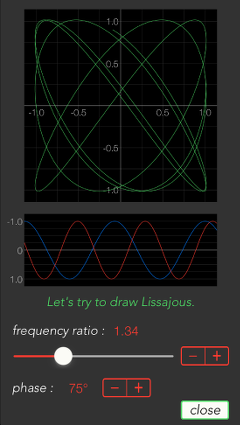 By changing both the frequency ratio and the phase, you can see Lissajous curve. It will draw a Lissajous curve of the signal to be generated by the following equation. By tapping "info" button, it is displayed the product description and Lissajous demo. If you tap "support" button, Safari starts and you can see our support page. By tapping "close" button, it will move to the top view. The internal reference signal and the measured signal are asynchronous. Since the signals from the microphone and other external inputs are not synchronized, the synchronization relationship is not guaranteed by stop/start, change of various parameters, etc. The phase θ is valid only when the reference frequency and the measurement frequency are the same. At the time of the first access to Microphone and Photos after installing the app, you will be asked authorization to access them by the iOS system. If you have not enabled this setting, the app can not access them by privacy restrictions of the iOS system. Please enable the access permission on the iOS setting, "Settings > Privacy > Photos or Microphone". Please send a review message for "Sound Lissajous Meter".